Yep, it's awards season. 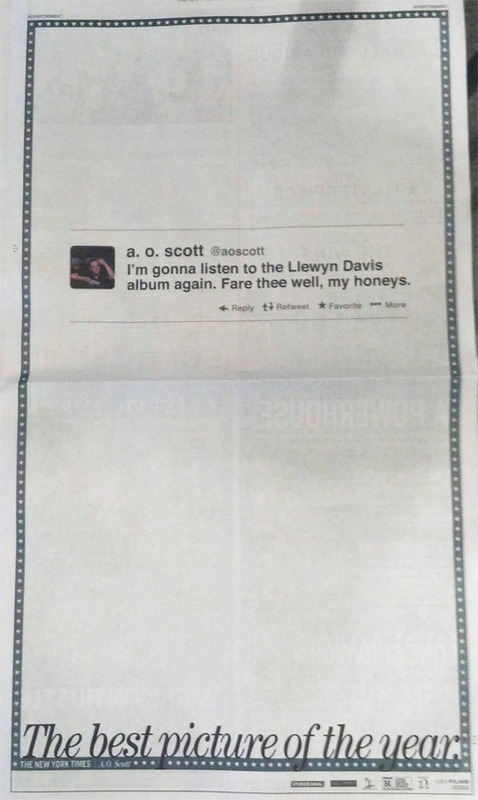 With the Oscar nominations voting closing this week, CBS Films is running one hell of a unique/ballsy marketing campaign in the NY Times for a film that is, indeed, one of the best of the year - the Coen Brothers' Inside Llewyn Davis. 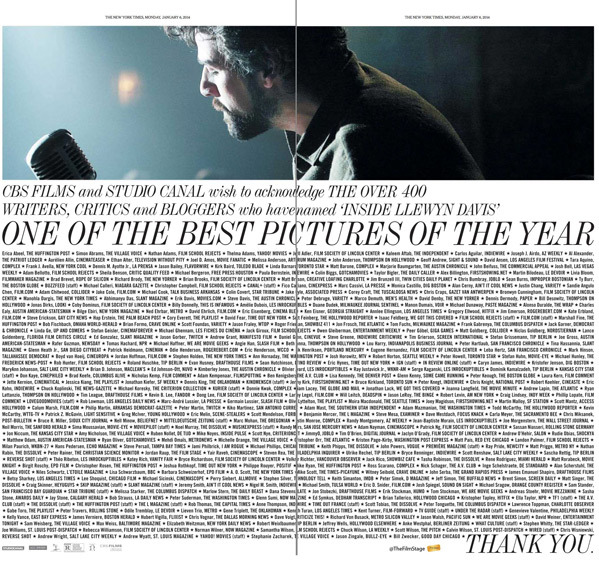 So far they've run two full-page ads in the Times for the new Coen Bros film, one of them featuring a list of over 400 critics' names (causing Twitter to go crazy in the afternoon) that have called Inside Llewyn Davis one of the best films of the year. The other is the now infamous tweet from NY Times' critic A.O. Scott talking about listening to one of the songs from the film about a folk musician, played excellently by Oscar Isaac (who also deserves a nomination). Photos below. 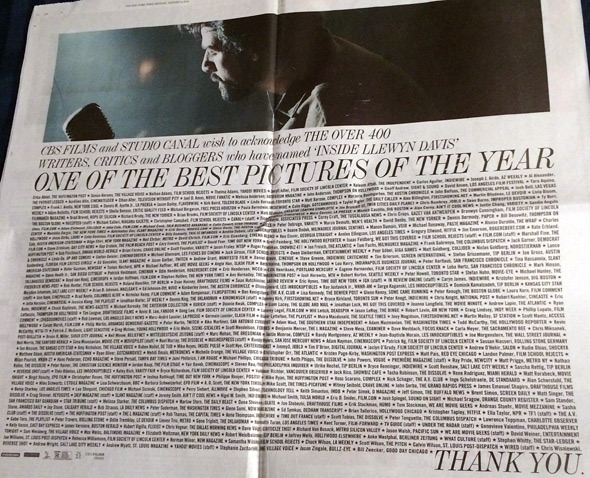 BREAKING: Two-page ad repeating 400 humans praising film in NYT may have cost more than combined salaries of said 400 praise-ers. Thanks again to @TheFilmStage for first finding and posting this in high res above. Now go see the film! Joel & Ethan Coen both wrote and directed Inside Llewyn Davis, which was originally inspired by real-life musician Dave Van Ronk. The story chronicles a struggling musician's time as a larger-than-life presence in the 60's folk music scene in Greenwich Village, known for the famous folk-music haunts and mentoring musicians such as Bob Dylan. Oscar Isaac, Justin Timberlake, Carey Mulligan, John Goodman, Garrett Hedlund, Adam Driver and more star in the film which also brings back O Brother Where Art Thou music producer T-Bone Burnett also working with Marcus Mumford of Mumford & Sons. CBS Films released the film in limited theaters on December 6th, but it's expanding in more theaters this weekend. Great way to get bloggers to talk even more about it.